I had nearly completed an article covering the first half of George Dyson’s life—I had had it illustrated and ready to go, when I had the urge to look up one more reference (as you do). Problem was, I found it. I also found another portrait of one of James Dyson’s many children. Cause to celebrate? Eventually perhaps, but for now I’m fuming that the carefully constructed narrative of George Dyson’s life I had lies in tatters and an incredibly more nuanced and interesting story still remains to be written. 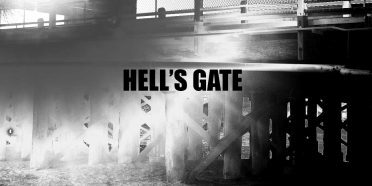 I had wanted to publish something now! So instead I intend to present a brief overview of George Dyson’s life, the most accomplished Dyson you’ve never heard about. The family twig occupied by George, one of the twenty-one children of James Dyson (former Tasmanian convict, later Western Australian civic identity), was the barest for the longest period of time. He was born 24 November 1864 in Perth, presumably at the family compound on the corner of Murray and King Streets, to James Dyson and his (by then) lawfully wedded second wife Jane. He was baptised in the Wesleyan Church, and he attended the Old Perth Boy’s school on St George’s Terrace, as had most of his brothers. 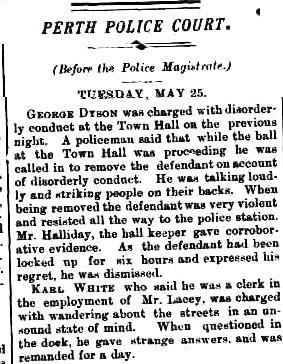 There are records of young George’s involvement with various debating societies connected with the Wesleyan Methodist church, and then there is the strange incident at the Perth Town Hall during 1886 when he was boorish at a ball and had to spend a few hours in the Police Lockup to cool off. Strange behaviour coming from George, but absolutely what you would expect from nearly any other child of James Dyson during this time. He owned some property in Hardinge street in the city during the 1890’s but he was always an absentee landlord. (The cottages on these properties might be those mentioned here that were being used for the purposes of prostitution!) It was obvious that George had moved interstate (or to the eastern colonies in pre-federation speak). Slowly it emerged that George had been apprenticed to the printing trade (as had been another of his brothers), was involved in the union movement, and dabbled in politics (as his father had done) only he had done it in Sydney, New South Wales. The problem is that Sydney is many magnitudes larger in size than his birthplace of Perth, and there were many more people there called Dyson, and a significant proportion of those all seemed to be called George. 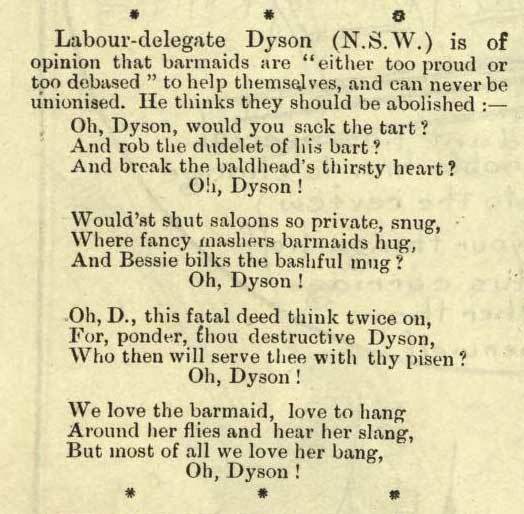 This was one final complication that only a son of James Dyson (of Perth) could fall prey to: Two George Dysons, both living in the Paddington area of Sydney about the same time, both with histories in the newspaper trade, and both candidates for public office in the same general electorate. Naturally enough, they were both on opposite sides of the political questions of the day, even more naturally our Dyson used the confusion to wind up his namesake. 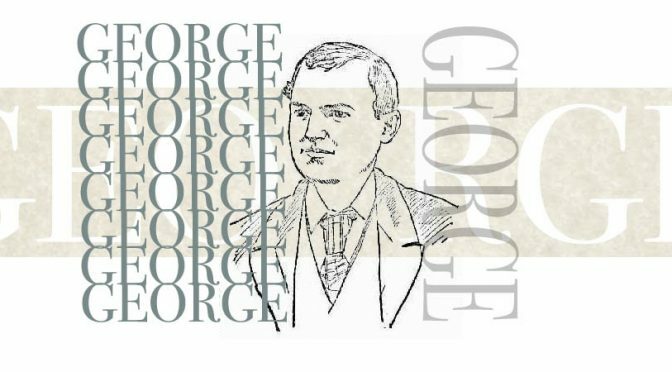 Our George was apprenticed to the Stirling brothers newspaper proprietors who were also associates of his father within the context of the Sons Of Australia Benefit Society. 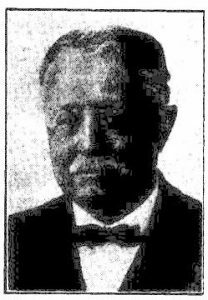 Whether by luck, family connection — or even natural talent — the young man was parachuted into a management and editorship position for a weekly newspaper in Albany in late 1886. He was twenty years old. After eighteen months he hopped on the next mail streamer for the eastern colonies. Six months later, that Albany newspaper abruptly closed. You must draw your own conclusions as to how successful his first gig had been (at least until I write up this period of his life properly). Settling in Sydney and working for a large publication called the Evening News, he seemed to have found his natural environment. 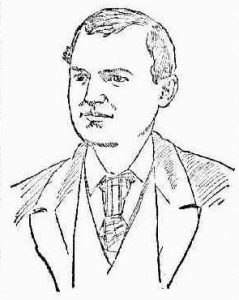 He rose swiftly through the union movement as a delegate for that aforementioned Typographic Association, finally to be nominated as a candidate for what would become the Australian Labor Party in its first ever electoral contest in the lower house of the New South Wales parliament during 1891. He failed to secure a seat by a mere handful of votes. He was now aged twenty-three. By late 1898 George Dyson was back in Sydney in his preferred suburb of Paddington. He considered running again for colonial parliament that year as a single-issue candidate, but seems not to have done so. Next year he married. He was thirty-five years old. His new wife was thirty-six and a divorcee with three children by her former husband; a greatly respected former newspaper journalist and then current town clerk for the city of Paddington, Mr Augustus Vialoux. Awkward? I have no idea who got custody of the children but I suspect it was not George and his new wife. The former Miss Jane Annie Utting was herself the daughter of a distinguished and highly respected journalist Mr. John James Utting. Perhaps it was for this reason there is absolutely nothing about the Vialoux divorce in any of the newspapers when in any other instance they would be all over a story like this like flies on the carcass of a dead rhino. Perhaps it is also the reason that George Dyson’s newspaper and career in politics quietly fades away about this time. Like his father he had ambitions to be a city councillor, unlike his father he never succeeded, but he nominated for the Bligh Ward of the Sydney City Council in both 1901 and 1912. A few years before his death, he moved to 12 Griffin Street in Surrey Hills. It was there he died on 8 March 1928, aged sixty-three years. The next day he was buried in the Waverley Cemetery, but there were at least two more twists to his tale. George Dyson was buried in the Roman Catholic portion of that burial ground. Had he converted to Catholicism? When, and what had been the ramifications? He had married a divorcee— how was that reconciled? Maybe it wasn’t. He and Jane had no children of their own together; and the same year George died, Jane Annie Dyson remarried… her former husband Augustus Vialoux. It is by no means certain at this stage whether that wedding took place before or after George Dyson was laid in the ground. For a family member who had been nearly completely forgotten George Dyson has proved to have one of the richest historical records of any of his kin. Unlike 99% of his contemporaries, we have insights into what he actually thought and said about subjects including the behaviour of the rest of his family. He is the only Dyson I know of to have been immortalised in verse (other than Drewy!) and then by none other than by that stalwart of incipient Australian nationalism (and racism) the Bulletin Magazine. …There shall be more to say about this!